A long summer break ended for NASA's New Horizons on Sept. 11, as the spacecraft "woke" itself on schedule from a five-month hibernation period. 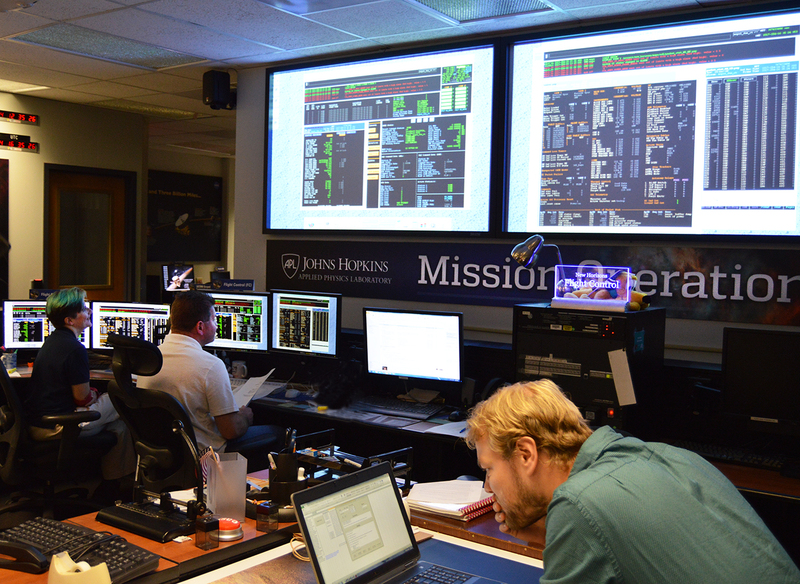 Signals confirming that New Horizons had executed on-board computer commands to exit hibernation reached mission operations at the Johns Hopkins Applied Physics Lab in Laurel, Maryland, via NASA's Deep Space Network station in Madrid, Spain, at 12:55 p.m. EDT. Mission Operations Manager Alice Bowman of APL confirmed that the spacecraft was in good health and operating normally, with all systems coming back online as expected. Over the next three days, the mission ops team will bring the spacecraft into "active" mode, preparing it for a series of science-instrument checkouts and data-collection activities that will last until mid-December. "It's another working science cruise through the Kuiper Belt for New Horizons," Bowman added. Plenty of activity awaits New Horizons over the next several weeks, both the team on Earth and the spacecraft – which is more than 3.6 billion miles (5.8 billion kilometers) from home, speeding toward a close flyby of Kuiper Belt object (KBO) 2014 MU69 on Jan. 1, 2019. The spacecraft will train its instruments on numerous distant KBOs, making long-distance observations with the telescopic Long Range Reconnaissance Imager (LORRI), while also continuously measuring the Kuiper Belt's radiation, dust, and gas environment. The team also will test the spacecraft's instruments in preparation for next year's approach to MU69, and transmit a new suite of fault-protection software – also known as autonomy software – to New Horizons' computer in early October. On Dec. 22 New Horizons goes back into hibernation, where it will remain until next June 4 – when the team wakes the spacecraft for the last time to begin preparations for the MU69 approach. The 157-day hibernation period that ended Sept. 11 was the spacecraft's first "rest" since before the Pluto flyby in July 2015, and one of two hibernation periods before the MU69 flyby. New Horizons is 369 million miles (593 million kilometers) – about four times the distance between Earth and the Sun – from 2014 MU69, which it will fly by in 476 days.